If you’re heading to a party or out to a club and want to wear a pink wig, then we’ve got the tips on the kinds of outfits and costumes best suited to this fun and edgy colour. Who Can Wear Pink Wigs? Hair extensions (whether braided, bonded, clamped, fused or wigs) give you the freedom to experiment and although not a traditional hair colour, it might be worth checking out the hair colour and skin tone guide which outlines the different skin tones and the hair colours that work best with each. If you have a cool undertone to your skin colour then go for deeper pinks and conversely if you have a warmer undertone to your skin then fuchsias and hot pinks will work well. If you’re going to wear pink hair then it’s better not to wear pink clothes unless it’s a costume. The colours that don’t clash with pink are yellows, blues, browns, purples, greens and black – black is great for muting the intensity of the wig. Avoid red as it’s on the same scale as pink so won’t compliment the colour. There are seen plenty of singer starlets with off-beat or dramatic styles of dress, a wig that's pink is great to add to this style of dress to really complete the look. Easy-peasy. Put on lots of big jewellery, necklaces and bracelets and bright make up (avoid red lipstick, keep it funky with pink lippy instead!). Incorporate leg warmers over legging, or skinny jeans, puffed skirts and my favourite, take a loose shirt (you can slash the collar so it exposes a shoulder), tie a knot in the bottom near your hip, throw on a large belt and clash until your heart’s content! If you’re thinking of going to a party, that’s themed or making a statement on a night out then here are some ways to wear your wig and wear it pink. If you’ve got sparkly dress or leggings these are great for fairy/princess outfits. If you’ve got ballet looking shoes – pale flat shoes and glittery make up then this will really enhance your look. So you see, you can wear a pink wig either as part of a costume or a fashion statement, the choice is yours. 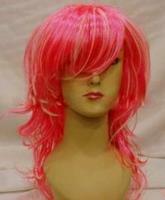 If you prefer to keep it subtle then perhaps pink hair extensions are a more suited alternative. 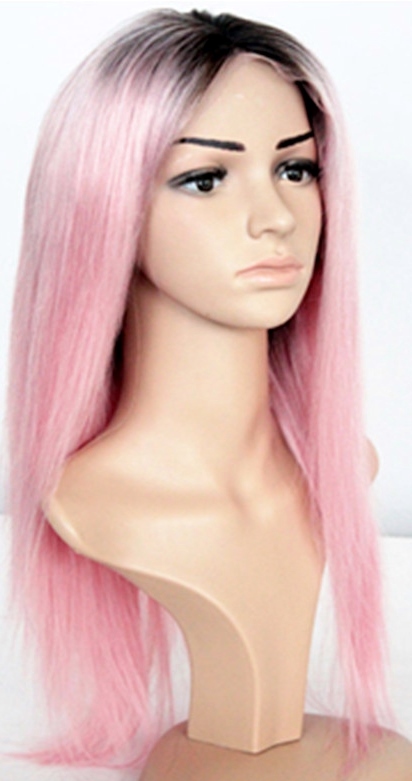 You can usually find good quality synthetic pink wigs online and of course we'll have them here. These wigs can start from about £10 ($17 USD) all the way up to the dizzying heights of about £35 (about $50 US) in other words, affordable, you'll look pretty in pink without all the cost. If you have a customised human hair blue lace wig then you’ll need to deep condition with a conditioner specifically for chemically treated hair or one designed for dyed hair in order to slow the rate at which the colour fades. So there it is! Proof that anyone can wear lace front wigs as long as the colour complements skin tone (whatever the length). Now you can bounce through your front door and your blue lace wig will turn others green with envy!